There is no chance that anyone would ever say". I kid you not. We are a menagerie of adventures. Take yesterday for example. There is no chance that anyone would ever say my house is "boring". I kid you not. We are a menagerie of adventures. Take yesterday for example. It was a sunny day. Birds were chirping. There was a mellow breeze. My children were both laughing. Then it grew quiet. NOT a good sign. I hollered the kiddos' names and there was no reply. Okay, so let's flashback to the LAST time this happened...I took a short stroll to the mailbox. I can see the steps leading to my door from the mailbox. It took all of three minutes and as I'm approaching the front door my then four-year-old, announces that my then two-year-old is "gone". "What do you mean he's GONE? Where did he go?" This became the topic for the next 25 minutes. I FRANTICALLY ran up and down the street SCREAMING his name. I searched the bushes, knocked on doors and stopped pedestrians asking if they had seen him or any crazily driven cars. After 15 minutes more of horrified INSANITY, I called 9-1-1, admitting I was today's worst mother. I'd like to say I was calm. I was in giving my address to the dispatcher; however, following every number in my address was the hysterical sound of me calling MY child's name still with NO REPLY. My voice was shrill, my breathing heavy. Five minutes after I hung up the phone with 9-1-1 MY child WALKS out of a bush (one I had checked SEVERAL times) a muddy mess from where he BURROWED his little self into the dirt, with a big grin and says, "SURPRISE!" I'm not going to lie; my first instinct was to beat the kid to a bloody pulp! Thankfully, common sense kicked in because a few moments after my child shouted, "Surprise", police officers stormed my porch. That happens when you call 9-1-1. Okay, back to yesterday and the NO reply. My heart takes off from the memories of the last time this happened. I'm still appearing calm and collected. I step outside, and on the sidewalk, basking in the sun, are my children. In front of them is a very large rock they have rolled out of the planting area. "Check it out, Mom. We have a new pet. His name is Slug. As I walked closer I see what they have found. A Snail! 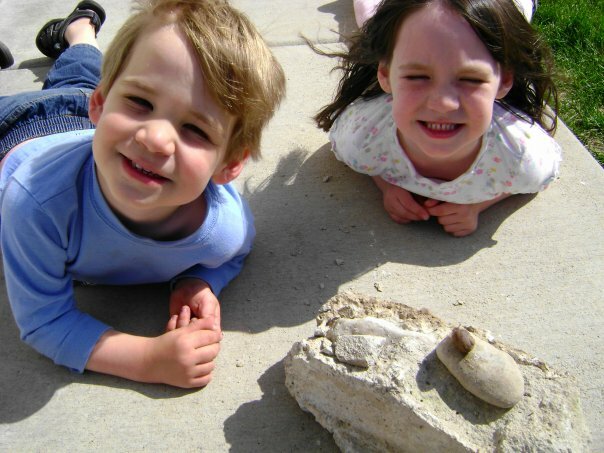 My children, perfectly content, bellies on the pavement, are watching Slug move his head and antennas. I spread out on the sidewalk with them. I watch my children as they gasp at the tiniest thing their snail does. They applaud the snail as if they have trained it to move his head to the right and wiggle his antennae. My three-year-old even pointed out, "Slug has a vampire worm on his neck that is sucking his blood." I look closer and see there is a tiny, green caterpillar crawling on the snail's neck. His sister corrected him and said, "Slug is a girl so you have to say, "SHE"! SHE has a vampire worm on HER neck that his sucking HER blood." Yeah. Because that part about the vampire worm, it is TOTALLY accurate!